Looks like these did really good at ECC! Yeah, Harvo did great and he was the only one there with the axles! Thanks Wish I could have followed through with a great finals course. During the day of driving at ECC, I really mashed my truck into a couple of spots that I had to work to get out of. One bad spot was one of those situations where the left rear was under a ledge and the right rear was pulling against the the outside front of the ledge... so basically the one side was trying to pull the other farther under the ledge while the one under was trying to climb back and out. I was worried for the first pull or two of the trigger... but after about 12, I could see there was going to be ZERO strength issues with the cases. Multiple posts after the first post updated with install info and product info. I was lucky enough receive my set yesterday, thanks Erik, plus a bunch of other stuff, I'll be starting build thread soon. Just a couple of questions to you. One you suggested to me in a pm but its worth mentioning on here I think. My other head scratcher is what stops the shafts pulling out of Eriks modified Bully knuckles? When he machines them the lip that stop the bearing popping out is removed. 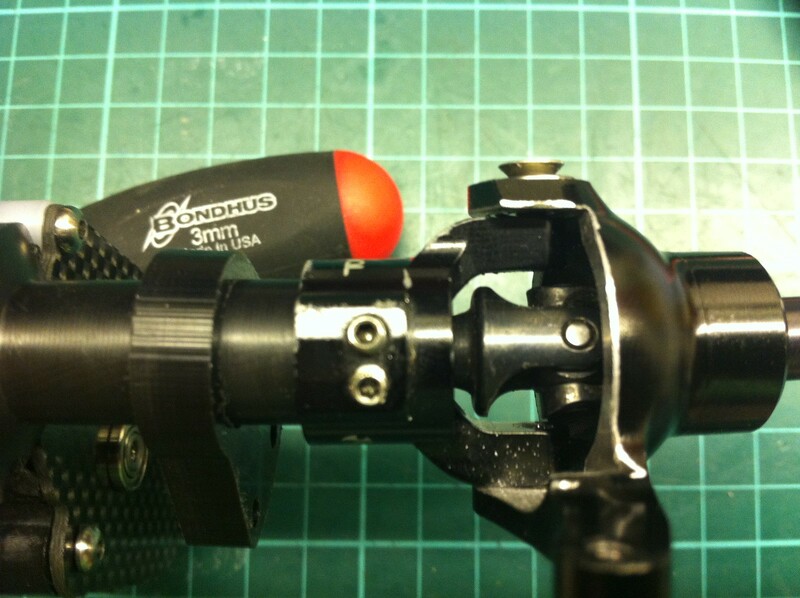 Erik pm'd me to say the 3 bearings are red loctited in together, (obviously into the knuckle and not onto the shaft!) question, is it like my pic below, or am I missing something ? its been a long night! You'll also notice the shaft just sticks past the end of the bully hex maybe 1mm, this prevent it from seating flat in the wheel hub, do I drill out the hub on the wheel for this? clearance for the shaft only? Last edited by jordi555; 06-01-2013 at 08:43 AM. Thanks for posting up in here! I know I missed some small details such as youre having an issue with so I think this will help many. Another thing I know I need to get in here is the steering links. I will take some pictures and post up as soon as possible. To answer the above question, yes, just like your pic below. Put some red loc tite on all 3 bearings. You dont need a lot just a drop on each one that are 180* from each other. 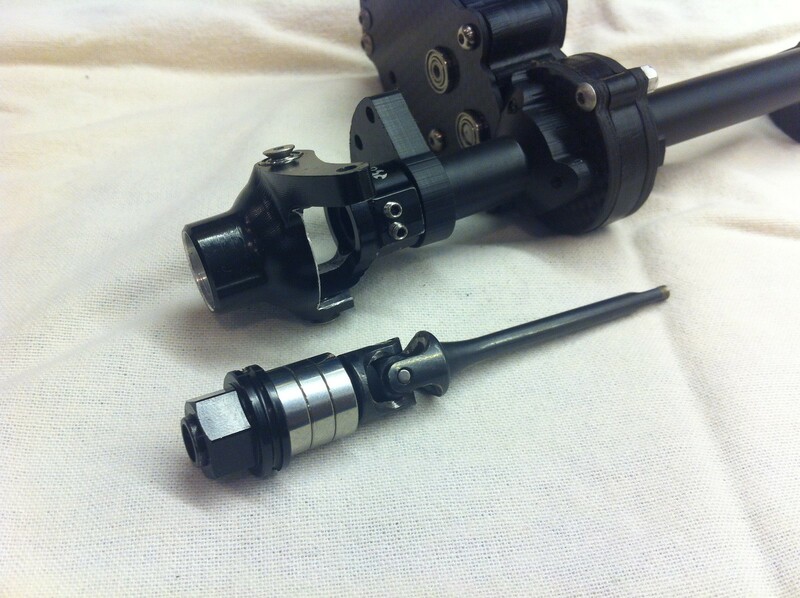 Install just like you have it in the pic and press the bearings in as far as they will go against the shoulder of the shaft. This makes it so my axle shafts have no in and out play as soon as the loc tite cures. It makes for a really solid, slop free front end. Also note that the bearing on the hex side will sit out side of the knuckle a bit. It will be even worse if you use a Bully shaft vs the Dlux shaft. On the Bully shafts you may not even be able to use all 3 bearings. If you dont like the bearing sitting out side of the knuckle or if youre running Bully style shafts you may not be able to run all 3 bearings. That is fine, just run 2. One on the inside pushed against the shoulder of the shaft and then 1 flush with the outside of the knuckle. Grind down the end of the stub shaft so that it is flush with the hex. You can even go further than flush with the hex to make sure it fits well. Can you post up a full list of bearing sizes as I'd like to order up a set for spares locally. Whilst installing the front shafts I noticed this, the long side sits in perfectly allowing full range of movement of the UJ, whereas the short side doesnt sit the whole way in, well it does, but it is as if something is a touch too long. 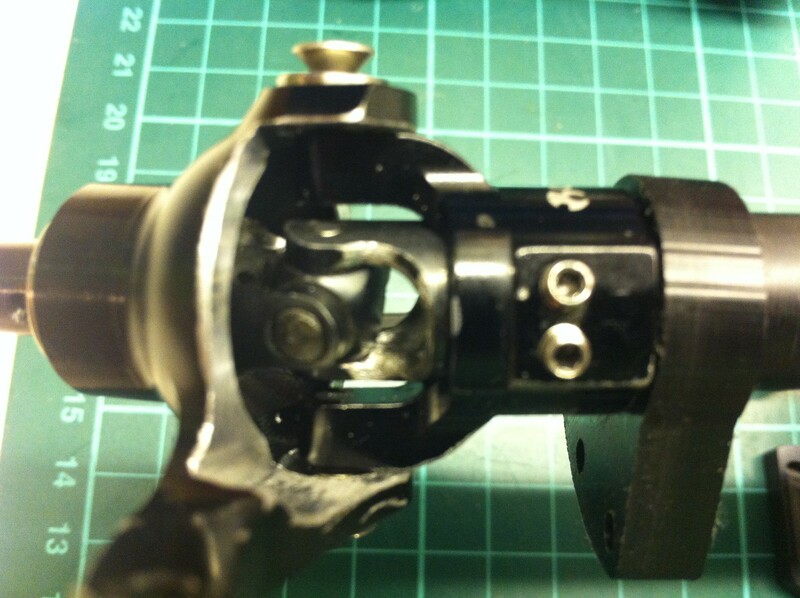 If I loctite the bearings in like this I hardly get any steering as the kingpin doesnt line up in the right place.. So do I grind the end of the shaft down ? The C is seated correctly, I've double checked that already. On the second picture you can see where the shaft sticks out and doesn't sit right.. I found that I sent a couple of short side shafts out that were .100 too long, looks like you got one of them, sorry. Your best option is to grind the shaft down .100 or 2.5mm so it seats in the locker a touch better. Just be careful to not disturb the already good fitting part. Try to take the radius down to the same level as I already have, not a touch further. If youre unable or wiling to do this, send me a PM and I will make sure youre good with the parts, it just makes it hard with you being so far away and shipping times being so far out and expensive. 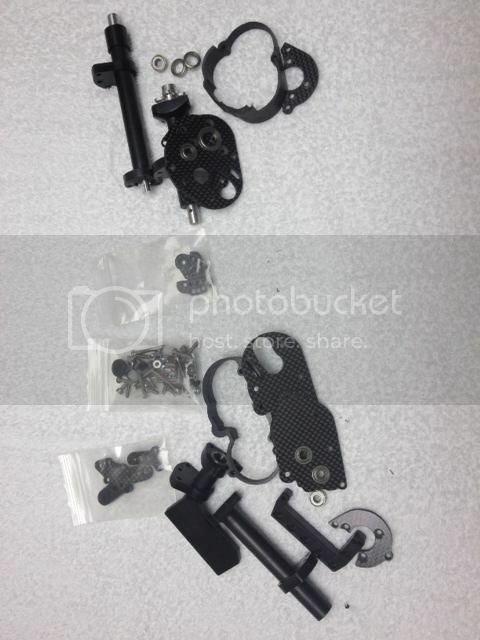 What about positioning of the link and shocks mounts, any preferences for these? Distance from lockouts and C hubs + angle of attack ? There are a million options for shock/link positions which I have found to be a very good thing for chassis such as the Stingray where its important to get the links right where you want them without binding. What I do is a get the car all together and the link/shock mounts are the last thing I do. I then move them around on the axles until they are a good as they get, drill for a set screw and youre done. For the front I have always pressed them against the chub, you need the room for the nut to sit between the servo. On the rear, thats up to you on how wide you want to put them. I think I told DickyT that I had mine .3" in from the lockout? Remember, you can put the shock on either side of the mount so if you put them too narrow on purpose, you can always be saved by moving them to the outside. I have just a couple more sets of these and then they may be going out of stock for a bit. Bump for the absolute best cases, tubes, and axles on the market ! Mine are still running flawlessly since the beginning. You always have something up your sleeve, dont ya? Awesome mang! Thanks for the support! Just sold the last of this batch so it will be a week or so before I have the next batch done. I will keep them in stock on my website and keep this post updated if its longer than expected. Location: lethbridge Alberta Canada EH!!! Money sent ...check ....pm sent ....check...Amazing second to none service....doube triple check. for all those lonely crawlers forget about EHarmony to get hooked up just call MR.Eric. Dlux he will get you loving again.. there needs to be a vendor area to give warranted props because the best vendors should get a area for back pats and yatta boy's !!!!! !